Picking gas dirt bikes for kids can be a difficult job. There are tons of different bikes available online, but we’ve researched 11 of the best dirt bikes for you. So, all you need to do is read our guide below until you find the one that suits your child the best. If you were still feeling a little unsure as to which cheap gas dirt bike for kids to choose, there’s a buyer guide section at the end to provide you with some more clarity. 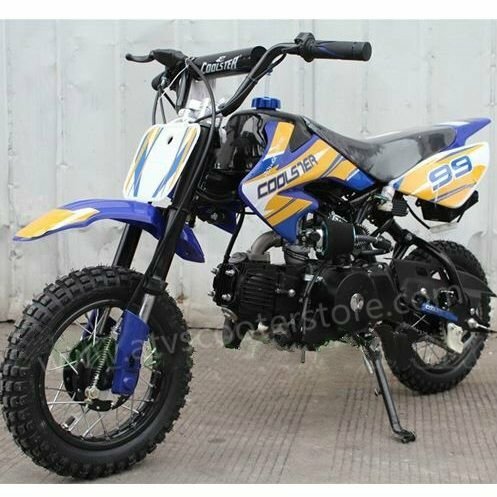 Coolster’s Mini Dirt Bike is an awesome choice for kids who are between the ages of 7 and 13 years old. We liked how this dirt bike can be used on various off-road surfaces and trail riding. It gives kids the opportunity to practice riding in more open spaces. It’s powered by gas which means you’ll need to refuel the tank every so often, depending on how much your child rides it. Moreover, it works on a semi-automatic system. Some parents prefer this option as the first dirt bike for their kids as it can be a little easier to get to grips with. There is a total of 4 gears available which provides children with different options to choose when riding. It ensures that they’re able to learn how shifting on a bike works easily from an early age so that they’re familiar with it if they move onto larger bikes. This bike can take a maximum weight capacity of 130 lbs, which is plenty for kids aged 7-13 years. Furthermore, the bike can reach a maximum speed of 30mph. We found this to be more than enough for kids to have a lot of fun without being dangerously fast. Parents have also been liking how the bike comes mostly assembled. All that’s required to assemble are the tires and handlebar. Kids have been loving how this bike is fantastic for being used on trail rides and off-road surfaces. It allows them to ride around in open areas and get used to using the 4 gears available to build their confidence. This Gas bike by SAY YEAH has an excellent design which is bound to get your child excited to ride it. The gas tank available can hold a maximum of 1.3 liters. With this capacity filled, you’re able to get an impressive 25 miles of riding before it needs refilling. Therefore, your child is given a lot of miles to ride around and have fun with. We liked how starting up the bike is easy too. it operates with a system that involves pulling a rope and revving the throttle. Initially, you may need to start it up for your child and teach them how to do it for themselves. It won’t take them long to get the hang of it and they’ll be able to ride around independently in no time. They’ve fitted disc brakes to the bike which gives parents assurance that their child can ride safely. These brakes are responsive and make coming to a stop very easy. As a result, it’s a great dirt bike for kids who are new to riding. SAY YEAHs dirt bike is a fantastic choice if you’re looking to buy your child’s first bike. It’s easy to start up and has a reliable braking mechanism to bring them to a stop without problems. MASSIMO’s MB200 Supersized mini bike is delivered to you in a pre-assembled state. All you need to do it assemble the handlebars, fill the tank up with gas, and you’re good to go! To make the dirt bike safe for kids, MASSIMO has equipped it with an engine stop button, chain guard, and exhaust heat shield. The bike can take a maximum weight capacity of up to 200 lbs, which is plenty for a child. We were impressed with how they’ve incorporated tires that are wider than many other mini gas dirt bikes. This provides your child with more traction to make their riding experience more stable and smoother. Not to mention, they’ve fitted dual suspension cushions at the front of the bike too. So, if your child is riding over some bumpy surfaces, the suspension will minimize any discomfort for a better experience. With wider tires and dual suspension cushions at the front, your child will be able to ride around with stability and smoothness. This Flying Horse Gas Mini Dirt Bike is powered by a 49cc 2-stroke engine. We found this to be a great option for kids who are around 8 years old as the power available isn’t too overwhelming for them. It’s an excellent starter bike which they can use to build their confidence with riding. Moreover, the transmission is automatic. Therefore, younger kids won’t have to worry about getting to grips with switching gears. Instead, they can simply ride around and have fun. The brakes available operate with disks which makes coming to a stop super easy for newbies. Starting the bike up is a simple process for kids. It works on a pull-start system which is easy to get the hang of. We liked how the engine has an air-cooling system too. It prevents any overheating issues which improve the longevity of the bike. Parents have been pleased to find that the bike is delivered in a pre-assembled state. You just need to make some adjustments to the wheel bolts, handlebars, disk brakes and add some fuel. If your child is completely new to riding dirt bikes, this Flying Horse option is worth considering. It’s easy to start up and ride due to it’s pull-start and automatic transmission features. Moreover, braking is easy because of the disk and caliper mechanisms. 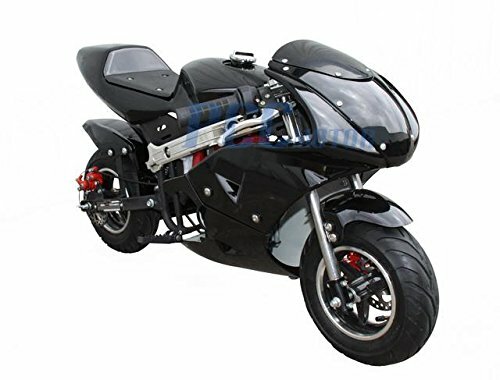 Monster Moto’s MM-B80-LB Black Legends Blaze Mini Bike is powered by an 80cc four-stroke engine and 2.5 HP. This is plenty of power for children who are 10 years and over to have a lot of fun with. At the same time, it’s not too powerful to the point where they can’t control it. We liked how the disc brakes are easy to use. They work with a cable which activated the rear disc brakes by using your hands. In addition to this design, the gusset has a powder coating over the top. This prevents any rust from causing the structure of the bike to weaken. Furthermore, there are fenders made with polypropylene which are resistant to bending. They’ve even fitted the bike with special off-road tires to ensure it can handle tricky terrain better. This bike is also a fantastic choice for kids who have never ridden a bike before. This is because it works on an automatic system, meaning there’s no shifting needed to ride. So, there’s one less thing for younger kids to learn and instead, they can enjoy developing their confidence riding around. 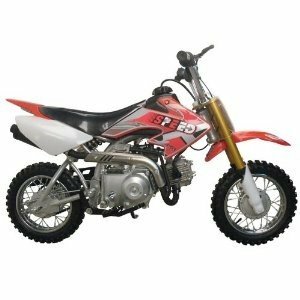 We recommend this dirt bike for kids who are new to dirt biking who are interested in riding off-road. The sturdy reinforced design and off-road tires make this bike effective at withstanding any rough and tumble. This DB49A Yellow Gas Dirt Bike has run on a 49cc 2-stroke engine. 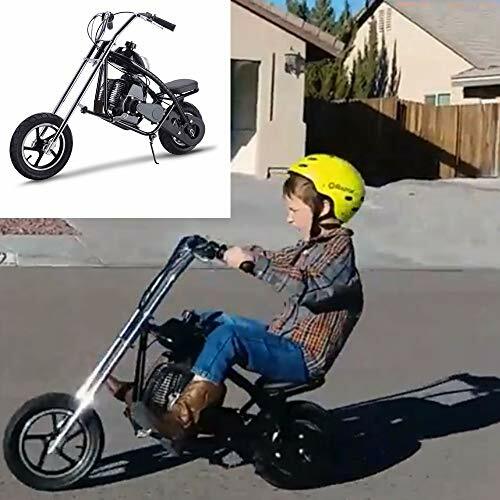 This ensures that kids who are 10 years or older have enough power to have a blast with, but not enough to where the bike can easily go out of control. We liked how there’s an air-cooling feature for the motor. It prevents any overheating issues which are awesome for boosting the lifespan of the engine. Parents who are looking to introduce their kids to dirt bikes would be interested in this bike due to its automatic transmission. Since there’s no shifting required, your child can simply hop on and start riding without having to learn how to shift. This can sometimes be the best way to up your child’s confidence with riding until they’re ready to move onto bigger bikes with gears. The fuel tank is large and can hold a maximum of 1 gallon of gasoline, as well as 2 cycle oil. The advised mixing ratio is 25:1 of gas and cycle oil. This dirt bike can also hold a weight capacity of up to 100 lbs, which is supportive enough for kids. What age is this dirt bike recommended for? The 1-gallon gas tank capacity is pretty large and ensures that your child can ride around for a long time before refueling. Therefore, they can improve their riding confidence from an early age better. PCC Motor’s DB40A 52L Gas Dirt Bike operates on a 40cc 4-stroke engine. As a result, it’s able to reach a maximum speed of up to 15mph. We found this to be perfect for kids who are 9 years or older as they’re provided with plenty of speed to have fun with. The engine has an air-cooling function. It’s effective at keeping the engine healthier for a longer period of time by preventing any overheating issues. When the gas tank is filled up to the top, you’re able to get an impressive 30 miles out of the bike before it needs refueling. The pull-start function is easy to get the hang of too. You may need to teach your child how to start it up the first few times, but they’ll get to grips with it pretty fast. We were impressed with how they’ve incorporated GP racing tires that have high traction. This provides the bike with a lot of grips to the ground to ensure your child can ride around with stability. What makes this dirt bike stand out? We liked how they’ve fitted this bike with high traction tires. They ensure the bike has an excellent grip to the ground which keeps your child safer and able to ride with more smoothness. This Semi-Automatic Dirt Bike operates with a 70cc 4-stroke engine. We liked how this engine has an air-cooling function to prevent it from overheating. As a result, you can expect the engine to last you for a long time. It has a maximum speed of up to 34mph which we found to be great for children who are around 9 years and older. They have the speed they need to have fun, without it feeling overwhelming. The bike has a kickstart function which is easy to use. Therefore, children who are just getting used to riding will have no issues starting it up. In addition to this, the semi-automatic system is easier for them to get used to, compared to a manual gear shift bike. There are brakes at the rear and front of the bike which makes it very reliable when you want to come to a complete stop. Moreover, there’s rear wheel force suspension to make riding across bumpy surfaces feel smoother. The kickstart, semi-automatic operation, and reliable brakes make this bike an excellent option for beginner riders. With a suspension system, they can be sure to have a blast riding around with stability and smoothness too. 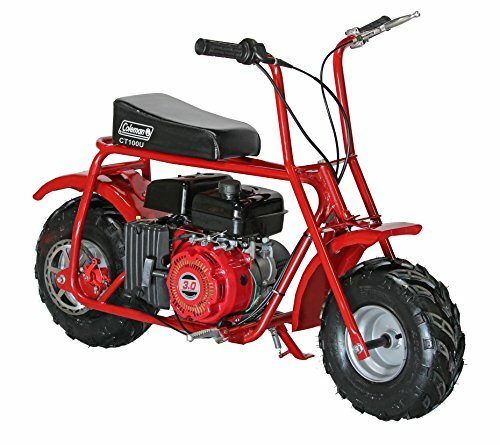 This 3HP 98cc 4-stroke dirt bike by Coleman Powersports provides your child with a lot of power to ride across trails and have tons of fun. We liked how it has a pull-start function as it’s pretty easy for kids to get the hang of. The tires that they’ve fitted have a low-pressure which makes for a smoother and more stable ride when going across rougher terrain. With rear drum brakes, you can also be assured that your child has plenty of braking power to bring them to a safe stop. The clutch they’ve fitted is sturdy and reliable too. We found that the frame has been made out of solid metal materials. As a result, you can ride around off-road and feel confident that the bike can withstand some damage for years to come. It also has a maximum weight capacity of up to 150 lbs, which is more than enough to support children. 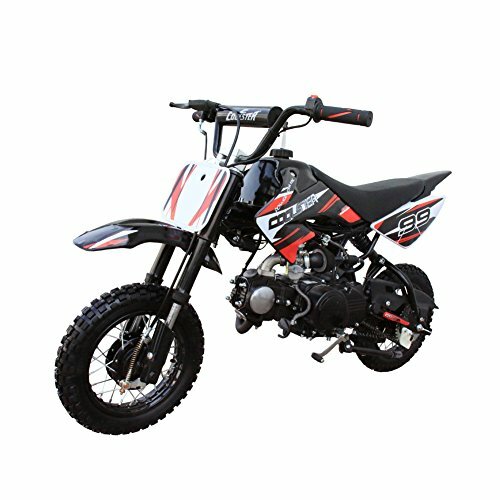 If your child is interested in riding their dirt bike on off-road trails, the sturdy metal design, reliable brakes, and clutch are all created to make riding a joyful experience. This TAO DB10 Dirt Bike has a 110cc 4-stroke single cylinder engine. This ensures that your child is provided with enough speed to ride around and have plenty of fun with. However, it’s not too much that it ever feels overwhelming. We liked how the engine has an air-cooling mechanism too. This is effective at stopping the engine from ever overheating. Therefore, it ensures the longevity of the bike is improved. There are numerous brakes available on this bike. There’s a handbrake, which activated the hydraulic disc when squeezed, and a foot brake which activates the brake drum at the rear of the bike. As a result, your child is provided with different and reliable braking options to come to a stop safely. Parents have been liking how the fuel capacity is 1-gallon. This means that you don’t have to refuel the bike all the time as the 1-gallon of gas gets your child a lot of miles of fun. With different braking options available, you can be assured that your child is able to come to a safe stop reliably while riding this bike. The large gas tank also enables them to ride around and have miles of fun without frequent refuels. This QG-213A dirt bike from Coolster comes in a fantastic blue color. It has been fitted with a 110cc 4-stroke 1-cylinder engine. This provides children between the ages of 8-13 with a lot of power to have fun with. This is especially the case if they’re a beginner. We liked how the engine has an air-cooling feature too. it works effectively to prevent the engine from overheating. Therefore, you can be sure that it will last you for years to come. 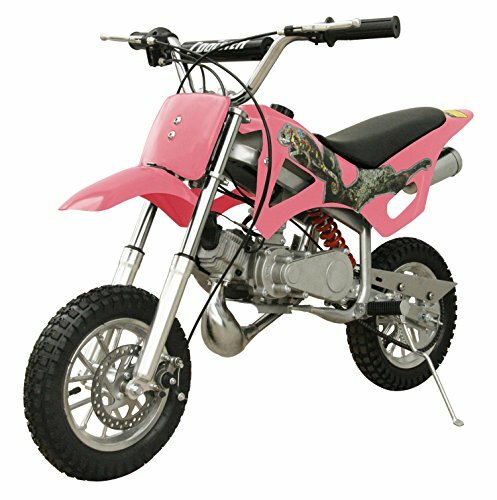 Parents have been choosing this dirt bike for their kids who are newbies to riding dirt bikes. One of the main reasons for this is because it operates on a fully automatic system. So, there’s no need for younger kids to have to learn about shifting through the gears. They can use this bike to gain their riding confidence before moving onto more powerful ones with gears later on. The drum brakes are also incredibly reliable and bring you to a stop with no issues. Kids who are new to riding dirt bikes would have a lot of fun with this one. It provides them with a good amount of power as a result of the 110cc engine. There are also no gears for them to have to shift through which may be best, to begin with. 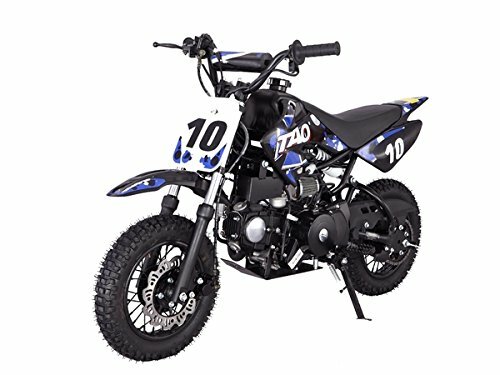 Knowing more about the details surrounding some of the top small gas dirt bikes for kids may still leave you feeling a little confused as to which one to pick. Well, to help make that process easier, you’ll want to take a look at the buyer’s guide section below. 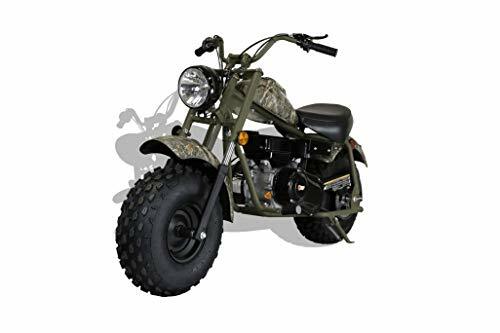 Powered ride-on toys are some of the best outdoor toys for kids but when it comes to picking a dirt bike, there are some important factors to consider to ensure you choose the best one for your child. Learn more about what these factors are here. Your child needs to be a certain age and state of development for a gas powered dirt bike to be safe since they can be a dangerous toy. We certainly don’t recommend them for Toddlers but do suggest you check out some of the more tame pedal ride on toys or slower dirt bikes for Toddlers if you want to get your son or daughter their first ride on toy. Each individual product above includes the appropriate recommended age from the manufacturer. One of the major things to consider when choosing motor dirt bikes for kids is how powerful it is. Being sure to pick a bike that has a suitable engine size for your child’s abilities and experience is crucial. Most of the dirt bikes in our review above are a low enough engine size to ensure that they’re safe for kids. If your child is completely new to riding bikes, choosing one with a lower cc may be best. It means the power is low enough for them to get used to riding the bike. They can then progressively move onto larger and more powerful dirt bikes as their confidence grows. You may be surprised to find that when kids ride these gas dirt bikes, they’re opening themselves up to some fantastic developmental benefits. Learning to ride a dirt bike means kids have to recruit their hand-eye coordination and balance skills. Furthermore, their spatial awareness abilities will be put to the test too. The physical side of riding a dirt bike shouldn’t be underestimated either. It encourages kids to be outdoors and be more active! 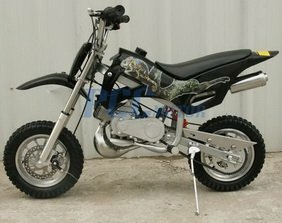 There are many different kinds of kids size dirt bike for sale. To help you distinguish the differences between them, as well as what some of the best brands are, have a read below. Yamaha is a Japanese corporation that covers an incredibly wide range of products. These vary from electronics to instruments. However, they’re very popular for manufacturing dirt bikes. They tend to be better suited for teenagers rather than kids because they’re more powerful than the ones mentioned in our review above. Honda Motor Co. was founded in 1948 and just a year later, they were putting small engines on bicycles. Since their very first motorbike in 1949, called the Dream D-Type A, they’ve come a long way. They’re a trusted brand that started manufacturing dirt bikes in the late 1960’s. Nowadays, users love using their bikes for off-road racing. Kawasaki is involved in making many different products, ranging from tractors, ships, aircraft equipment, and of course, dirt bikes. They began manufacturing motorcycles at the start of the 1950’s. In 1963, they released a 2-stroke 125cc motorcycle known as the B8M. Since then, the company tends to stick with 4-stroke engines that are powered by electricity. Razor is a popular brand in the U.S. that people associate with fun. Their recent range of dirt bikes for kids includes some impressive technology that still manages to stay within an affordable price range. 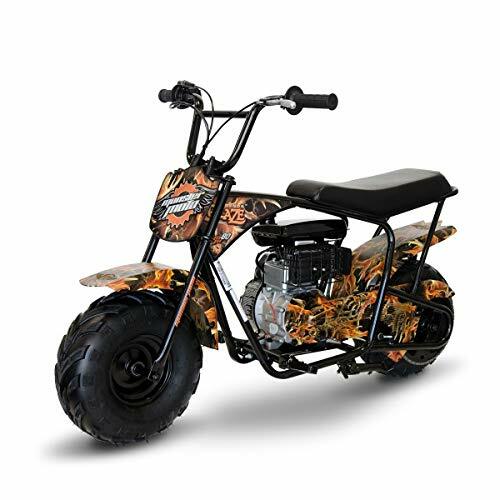 They manufacture electric dirt bikes which are available in different models to suit the age of your child. For example, the Razor MX350 if best for kids who are 5-8 years old. Whereas something like the Razor MX500 is ideal for children between the ages of 8 and 14 years. When it comes to searching online for the best dirt bikes for kids, Coleman Powersports is a brand that you’ll see popping up a lot. This is because the brand and the specific CT model has gained a good reputation over the years. The tires that they fit their bikes tend to be thicker. This provides kids with more control and stability while riding across any bumpy terrain. They’ve also ensured that they put a cap on the speed of these dirt bikes. This is to ensure that they’re safe for kids, while still giving them enough speed to have fun with. So, those were 11 of the best gas dirt bikes for kids that are available right now. Be sure to have a read through all of the options in our review above to gain the best understanding as to which dirt bike is best for your child. You should also keep in mind that these dirt bikes for kids gas powered will require refueling. So, allow an extra expense for the gas! Hopefully, our review has provided you with all the information you needed!